I have performed at multiple venues in New York City, including Carnegie Hall and Off-Broadway. I studied opera performance and musical theater at Westminster Choir College in Princeton, NJ and acting at Primary Stages. Along with these qualifications, my positive spirit and belief in my students has yielded outstanding results in their musical accomplishments. I've been teaching voice, guitar, and piano lessons for the past four years, as well as coaching students for specific auditions (school plays, national tours, honors choir auditions). Let me aid you in achieving your dreams! As a performer, I have learned that "learning" is never done in this field. Even as a professional, I still take private voice lessons, dance classes, and acting classes. As well as the occasional piano, guitar, and dialect coaching. My teaching style is based off of my many years of being a student to some of the finest performers in the world. I am direct and focused, but like to keep my students relaxed. My key to teaching success is adapting to each student's specific needs. If travelling to your home, I would require you have a keyboard. I can bring my guitar and pitch pipe. I plan singing flash mobs for clients all over the country! When a flash mob is in NYC or Jersey City I will ask my students to be part of the flash mob to gain experience performing for a crowd. They are also a lot of fun! AC Weekly and the Atlantic City Jaycees. 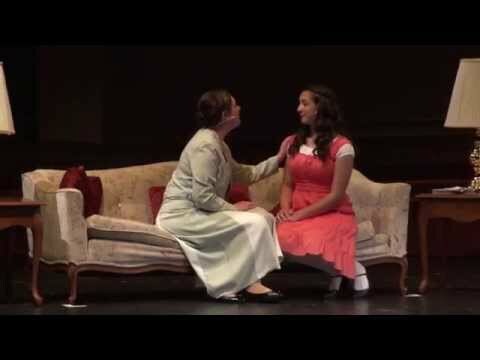 This is a video of me singing "My White Knight" from The Music Man. This is me singing "The Climb," made popular by Miley Cyrus. Rachel starring as Laurey in Oklahoma! She was absolutely fantastic with my 5 year old daughters first lesson. She had her smiling the whole time.....we are coming back next week for sure. My first vocal teacher and the best! Ms. Rachel was an amazing vocal teacher! We would always start off with simple and fun warm-ups, breathing techniques, and would practice singing songs from musicals. My first couple lessons she taught me how to sing I Feel Pretty from West Side Story and we both had so much fun with it! After a little while we learned Cups from Pitch Perfect and then we got into the Vaccai book and I learned a couple songs from there. Overall Ms. Rachel was the best! She even offered to Skype a lesson with me since she moved. She cared about me and always helped me improve my voice in every way she could. I love her!